Steri-Clean California has been helping people in California who struggle with clutter and/or hoarding for well over 2 decades. We take a different approach, where the human factor comes first. Every plan is not the same, in fact no 2 plans can be the same! The Steri-Clean method is so effective, we have successfully cleaned over 15,000 homes! Our first priority is to actually HELP our client, not make their situation worse. For this reason, we don't advertise on our vehicles. All of our vehicles are plain white and unmarked for discretion, or have a simple Steri-Clean logo with no description of what we do. We are blessed and truly thankful to have not just helped people declutter and clean their homes, but help them regain control of their lives! Hoarding is not caused by laziness, but is a much bigger issue. Hoarding is typically a complex issue with many layers. It is important that we realize how to allow our customers to remain in control while we help them unravel all the layers. This will not only allow the best progress at restoring functionality and safety to their home, but will also allow them to work on the many underlying issues that cause the hoarding behavior in the first place. We understand the position our California hoarding and clutttered clients are in and will provide everything they could need for a fresh start. Contact us today for hoarding cleanup help and start the road to recovering from this debilitating lifestyle. 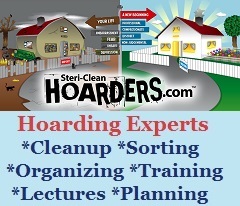 We offer free hoarding clean up estimates! Phone Support 7 days a week! Mary works with people both individually and in small groups and offers consultations to family members of clutterers. She participates in the LA County Hoarding Task Force, helping to assist seniors with Hoarding problems and educate other professionals re: hoarding. 3/08: currently not taking new patients. Beverly Taylor was the hypnotherapist on the TLC TV “Help! I’m a Hoarder” While the show ended up with hypnosis looking like a “magic cure”, it portrayed what actually happened (no special effects other than they sped up the morning’s cleaning). 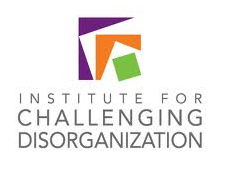 Beverly has worked with hoarders with OCD, but it takes a lot longer for them to see results (e.g., 12 or more sessions versus 3 to 6 for clutterers). Hoardeporting numbers, government agencies, state laws, state-specific data and statistics, and other resources.